Christmas Tree: Christmas is the most awaited season in the universe. This is the time where families become united, neighbors love each other, rich share their riches, poor feel love. Christmas is the mark of love in every christian home. In order to feel the Christmas people makes decoration just like having a lantern in and out of their houses. and the most notable is having a Christmas tree inside the house. even in churches they put up big Christmas to celebrate the birth of Jesus. 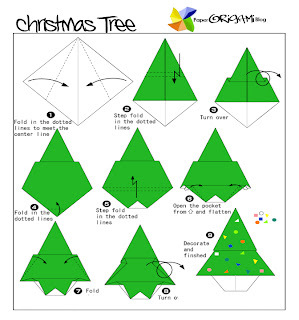 So now I will give you the diagram of folding Christmas tree origami its so simple and fun to do. You can also make 3d Christmas tree. 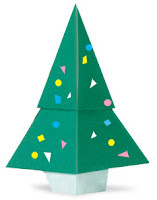 That's a new and cool way of making paper origami for Christmas trees. I wish I can do that this year's Christmas. I'll try practicing it on cheap paper first.